In a city known for deep-dish, this hideaway is churning out tasty slices of super-thin, cheese-heavy goliaths to the hungry masses craving a taste of the NYC wedge. 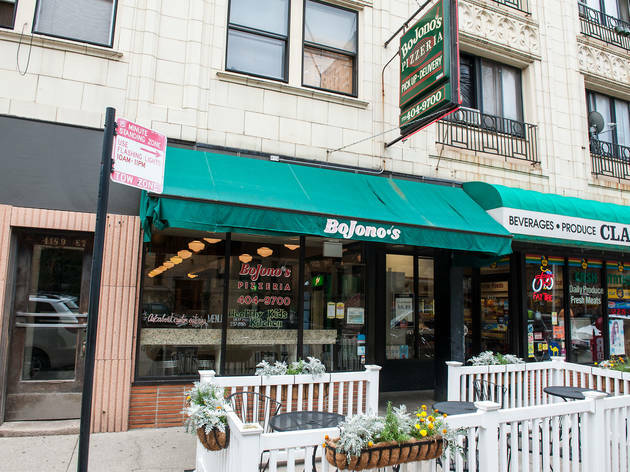 Mostly a storefront delivery/takeout joint, BoJono has a menu loaded with simple selections that fill the belly and appease those hard-core greasy cravings (we like the garlic, oil and tomato). The juicy steak sandwich—topped with bubbly cheese on toasted garlic bread—is a meat lover’s dream. Finish off with a slice (or two) of the tangy cheesecake. El stop: Red to Sheridan. Bus: 36, 80, 135, 136, 146, 148, 151. The best stuffed pizza in Chicago. 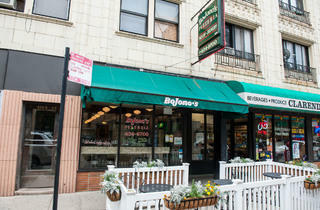 Bojono's also serves up a variety of other great pasta and salad fair. I love to swing by and grab a chopped salad after work when I neglect to go grocery shopping (which is often).